An antibiotic is defined as any chemical substance that is able to kill bacteria, fungi and parasites, and can thus be used against prokaryote and eukaryote organisms. Antibiotics can be produced by living organisms in a natural environment, and synthetically produced and used as medicine. In fact most antibiotics have been discovered by observation of natural organisms fighting off bacteria. Sometimes this has been accidental, for example, Alexander Fleming discovered the antibiotic penicillin by noting that the mold growing on his bacterial culture was killing the bacteria. Although they can be classified in this way there are antibiotics that can act both as antibacterials and antiparasitics. An example is metronidazole, which kills the bacterium Helicobacter pylori and the protozoan parasite Giardia. Antibiotics can target the peptidoglycan cell wall of bacteria or the chitin and glucan cell wall of fungi, DNA of bacteria and DNA of parasitic protozoa. In antibiotics that also target protozoa, the side effects can be severe because protozoa have eukaryotic cells similar to ours. Since antibiotics kill so many organisms, including beneficial bacteria, they can upset the natural balance in the human body. The result is that this can allow other harmful bacteria to thrive. For example, Clostridium difficile which can grow in excess after antibiotic use. C. difficile causes a dangerous gastrointestinal condition. This is why people are encouraged to take probiotics while on antibiotics. The other problem can occur if you do not take the entire course of antibiotics. This can lead to future antibiotic resistance since the remaining bacteria that are resistant are the cells left behind to reproduce. The antibiotic thus selects for the resistant organisms. This has become a major problem, e.g. Methicillin -resistant Staphylococcus aureus, which can be deadly. An antibacterial is a chemical substance that specifically kills bacterial cells. These substances are thus only effective against prokaryotic organisms that have the features typical of a bacterial cell. 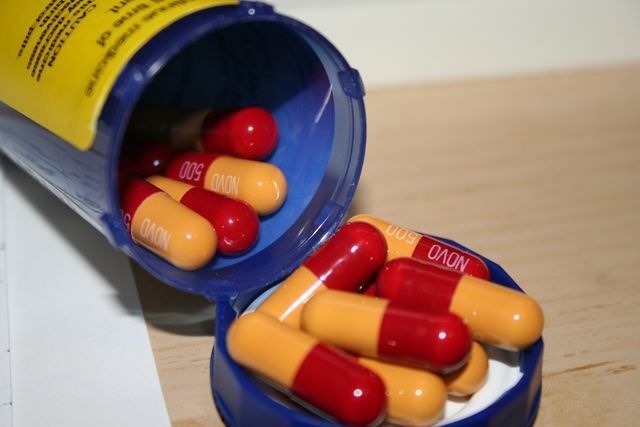 An antibiotic that is produced to only kill bacteria only has antibacterial properties. While the term antibacterial can refer to an antibiotic in everyday use it refers more often today to antibacterial soaps and disinfectant products that have been produced. Antibacterials can be produced synthetically as well as from living organisms. Bacteriocidal –these are antibacterials which completely kill and destroy bacterial cells. Bacteriostatic – these are antibacterials which inhibit the growth and reproduction of bacterial cells. Antibacterials can also be classified based on whether or not they leave a residue. An antibacterial targets a specific feature of bacteria such as the peptidoglycan cell wall, bacterial DNA or some aspect of metabolism that is unique to bacteria. Since antibacterials only target bacteria they are less harmful to humans and have fewer side effects than antiparasitic or antifungal antibiotics. This is because bacteria are prokaryotic cells which are very different from our cells, unlike fungi and parasites which have eukaryotic cells similar to ours. Antibacterial overuse in the form of excessive washing with hand sanitizers may lead to problems for children who may become more prone to allergies later in life. This is because children need to be exposed to microbes in order to develop a healthy immune system. 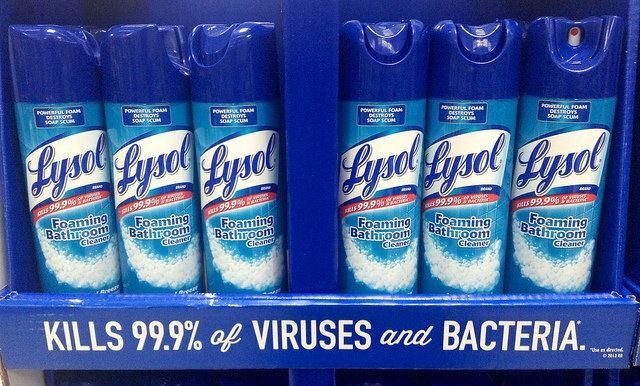 Antibacterial products in some cases leave a residue that kills all but the strongest bacteria. This means that more harmful bacteria are selected for resulting in bacterial resistance. Research with triclosan, a common ingredient in antibacterial sanitizers has shown a tendency for bacteria to develop resistance against the antibiotic isoniazid which is used to treat tuberculosis. Antibiotic refers to any chemical substance that targets and kills bacteria, fungi or parasites. Antibacterial refers to a chemical substance that is specifically designed to only target and kill bacteria. Antibiotics can target both eukaryotic and prokaryotic cells while an antibacterial can only target a prokaryotic cell. Antibacterials by definition only kill bacteria and thus only target the peptidoglycan cell wall, bacterial DNA and metabolism, while antibiotics may also target chitin and glucan fungal cell walls and DNA of parasites. In everyday use, the term antibiotics is used to refer to medicines that are taken as capsules, tablets or through an intravenous line, while the term antibacterials refers to substances that are used as ointments, soaps or disinfectants. Antibacterials are less harmful to people than antibiotics that can also kill parasites or those that kill fungi, because bacterial cells are very different to human cells. Antibiotics and antibacterials both kill bacteria but antibiotics can sometimes also kill fungi and parasites such as protozoa. Antibacterials only target features of prokaryotic bacterial cells, such as the peptidoglycan cell wall and DNA and metabolism unique to these cells. Antibiotics can target fungal cell walls and the DNA of parasites as well as bacterial features. In everyday language antibiotic is used to refer to medicine taken internally while antibacterial is used to refer to soaps and disinfectants. Dr. Rae Osborn. 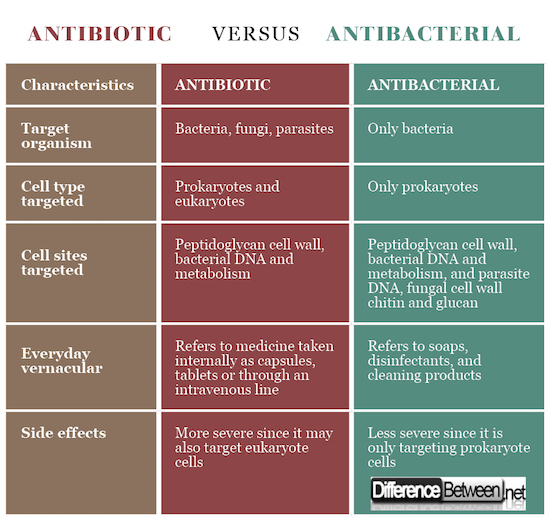 "Difference between Antibiotic and Antibacterial." DifferenceBetween.net. April 12, 2018 < http://www.differencebetween.net/science/health/difference-between-antibiotic-and-antibacterial/ >. Debono, Manuel, and Robert S. Gordee. "Antibiotics that inhibit fungal cell wall development." Annual Reviews in Microbiology 48.1 (1994): 471-497. Mobley, H. "How do antibiotics kill bacterial cells but not human cells?" Scientific American 294.6 (2006): 98-98. Samuelson, John. "Why metronidazole is active against both bacteria and parasites." Antimicrobial agents and chemotherapy 43.7 (1999): 1533-1541.